Summary and Definition: The Fourteen Points speech was a statement given to Congress on January 8, 1918 by President Woodrow Wilson declaring that WW1 was being fought for a moral cause and calling for peace in Europe. President Wilson's Fourteen Points became the basis for a peace program, suggesting that a League of Nations should be established to guarantee the political and territorial independence of countries. Fighting in WW1 ceased when the armistice went into effect on November 11, 1918. The 14 Points essentially established the conditions for the Armistice that brought an end to World War I. The "Great War" officially ended with signing of the Treaty of Versailles on June 28, 1919 which included elements from the Fourteen Points on Military and Territory changes and the creation of the League of Nations. Woodrow Wilson was the 28th American President who served in office from March 4, 1913 to March 4, 1921. One of the important events during his presidency was the Fourteen Points speech outlining ideas for WW1 peace. Who was the Author of the Fourteen Points? The author of the Fourteen points was President Woodrow Wilson with a significant contribution by Walter Lippmann (1889 – 1974) and 'Colonel' Edward House (1858 – 1938) together with input from a study group of academics called "The Inquiry". Walter Lippmann was a noted journalist and author who also acted as an adviser to President Woodrow Wilson during WW1. Edward House was an American diplomat and a powerful politician who also acted as a WW1 presidential advisor. Walter Lippmann and Edward House assisted in the drafting of post-World War I settlement plan which became known as Wilson's 14 Points speech. Contributions to the Fourteen points were also made by "The Inquiry" which was established in September 1917 by President Wilson to prepare materials for the peace negotiations in World War I. The Fourteen Points speech was made to a joint session of the US Congress on January 8, 1918. The Fourteen Points speech set out peace proposals under fourteen separate headings that described the essential elements for a peaceful settlement of WW1. The 14 Points declared by President Woodrow Wilson essentially established the conditions for the WW1 Armistice that had brought an end to WWI. What was the Goal of Woodrow Wilson's Fourteen Points? right of self-determination to "freely to determine, without external interference, their political status and to pursue their economic, social and cultural systems, without interference in any form by another State". Points 6-13 also required the Central Powers to evacuate all of the countries invaded during the war, including France, Russia and Belgium. Point 14 called for the creation of a “general association of nations” known as the League of Nations. The Fourteen Points speech called for the creation of a “general association of nations” known as the League of Nations. The purpose of the League of Nations was to ensure that the League’s member nations would help preserve peace and prevent future wars by pledging to protect and respect each other’s territory and political independence. What were the Fourteen Points? The following table contains facts providing a simplified summary of the Fourteen Points. Point 2 : Freedom of navigation on all seas. Point 4 : Countries to reduce armaments and weapons to a level required for public safety. Point 7 : Preservation of the sovereignty of Belgium and that it should be independent as before the war. Point 9 : All Italians are to be allowed to live in Italy and Italy's borders to be "along clearly recognizable lines of nationality." Point 10 : Self-determination should be allowed for all those living in Austria-Hungary. Point 11 : Self-determination and guarantees of independence for the Balkan states and its borders re-drawn. Point 13 : An independent Polish nation should be created which should have access to the sea. Point 14 : A League of Nations should be created to guarantee the political and territorial independence of all states. The Treaty of Versailles was signed in the Palace of Versailles in France on June 28, 1919. However, prior to the Treaty, after the fighting had stopped, a peace conference had begun in Paris in January 1919 with Britain, France, Italy and the USA dominating the conference. ● Germany was not invited to attend the peace conference and were not allowed to contribute to the negotiations. ● The Germans, like the Americans, assumed that the Fourteen Points plan would form the basis of the peace treaty. ● It soon became very apparent that Britain, France and Italy wanted to punish and take revenge on Germany and regain what they had lost in the war. ● The content of the Fourteen Points were twisted to ensure that Germany was punished. The Treaty of Versailles addressed the subjects of Military and Territory changes, but with a totally different objective to the Fourteen Points. ● Under the terms of the Treaty of Versailles Germany had to accept responsibility for the war which gave the right to confiscate German land, and to make massive cuts in the German army, navy and air force. ● The terms of the Treaty of Versailles also addressed War-Guilt provisions and demanded massive amounts of money (called Reparations) as compensation for the Great War. Fourteen Points: Which of the 14 points were included in the Treaty of Versailles? The Treaty of Versailles was signed in the Palace of Versailles in France on June 28, 1919. 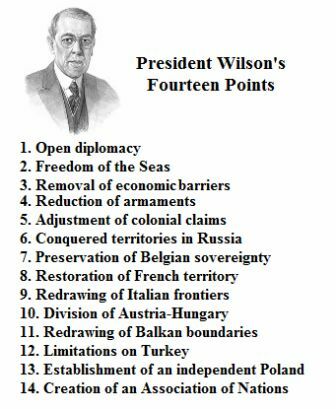 Which of Wilson's 14 points were included in the Treaty of Versailles? Perhaps the question should be "Which of the 14 points were not included in the Treaty of Versailles?" When the Allies met in Versailles to formulate the treaty to end WWI with Germany most of President Wilson’s 14 Points were scuttled and ruined by the leaders of England and France. Point 14: Creation of the League of Nations: The League of Nations was created but the Treaty of Versailles did not allow Germany to join it. 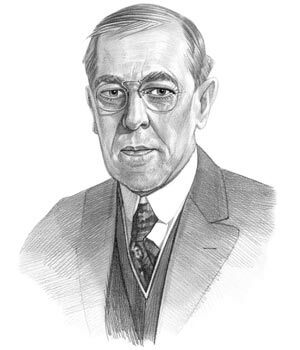 Fourteen Points for kids: Why was President Wilson disappointed with the Treaty of Versailles? President Wilson was disappointed with the Treaty of Versailles because it made a mockery of his Fourteen Points Plan. Wilson's idea of peace did not include punishing or exacting revenge on Germany. President Wilson wanted all countries to participate in an arms reduction program, while the treaty required that only Germany's military was restricted, leaving them with almost no defense forces of their own. Wilson had wanted colonial claims to be resolved fairly with consideration for those who lived in them. However, the Treaty of Versailles did not take this into consideration which resulted in Germany being divided into two. Other territories were returned to their original owners, which created further unrest in Europe. Wilson felt the ideas and the concept of the League of Nations had been critically compromised by the exclusion of Germany and could efficiently deal with international problems. The U.S. Senate consequently opposed the adoption of the Treaty of Versailles and declined membership in the League of Nations. The article on the Fourteen Points provides detailed facts and a summary of one of the important events during his presidential term in office. The following Woodrow Wilson video will give you additional important facts and dates about the political events experienced by the 28th American President whose presidency spanned from March 4, 1913 to March 4, 1921.